I mentioned in my last MooGoo post that I got to go to a lovely blogger lunch with the ladies from MooGoo and Dusty Girls. MooGoo (skincare), Dusty Girls (natural vegan makeup) and Dr Zoo (pet products) are Australian cruelty free sister brands. 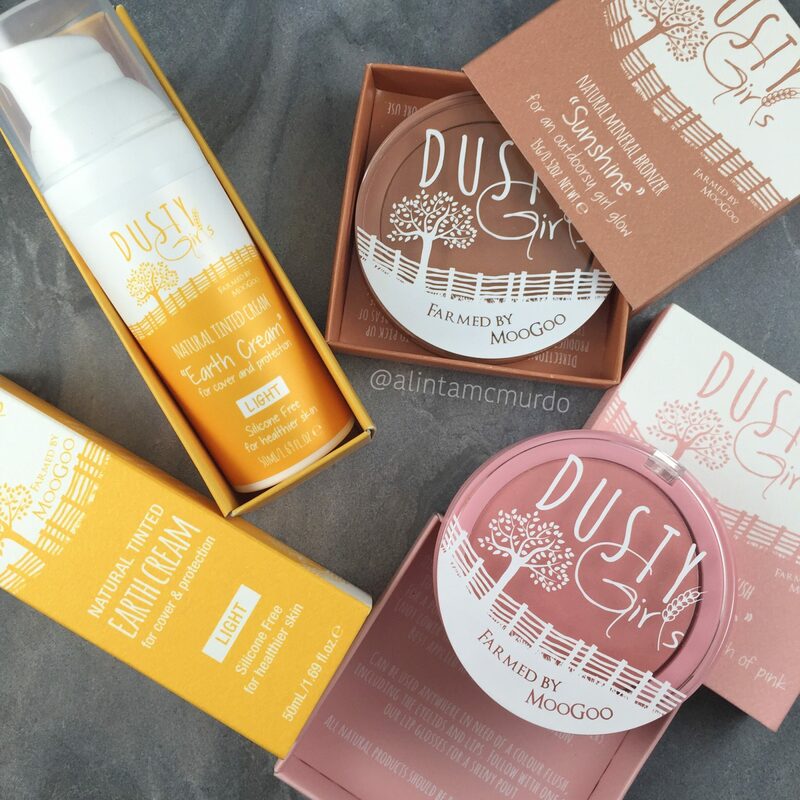 I am so obsessed with MooGoo so I was really excited to try the products from Dusty Girls. Today, I have a review of the face products in their collection, including their foundation, tinted cream, bronzer and blushes. The Dusty Girls Natural Mineral Foundation is a loose powder that comes in 10g for $29. They advertise it as being suitable for all skin types, but especially sensitive skin as it is filler free. The Natural Mineral Foundation comes in 7 shades, with cool, warm and neutral undertones in the fair and medium varieties. 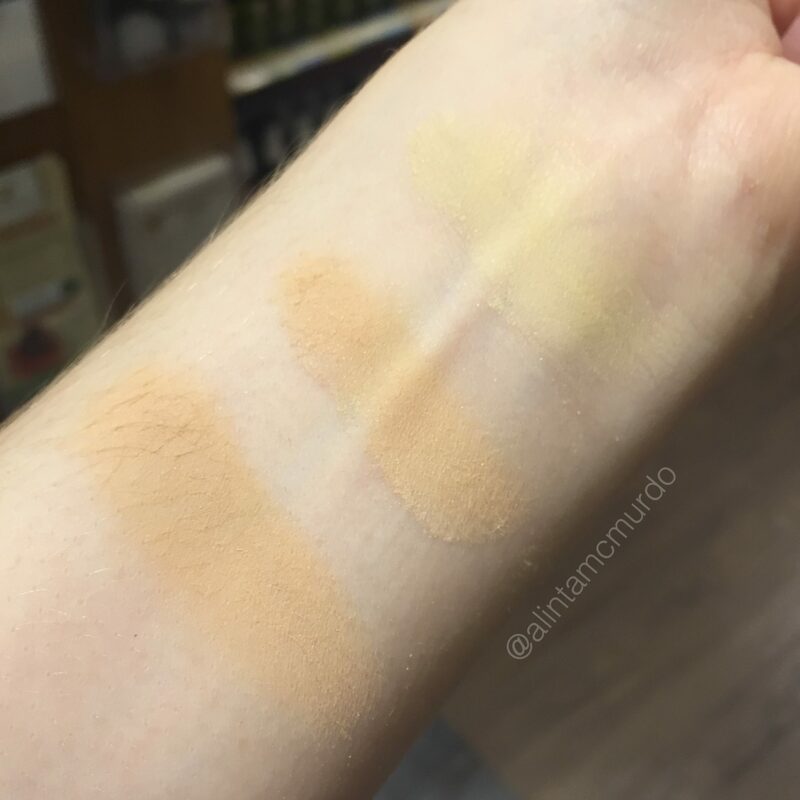 I don’t have this product so I went in store to swatch the ‘fair’ shades from their range. 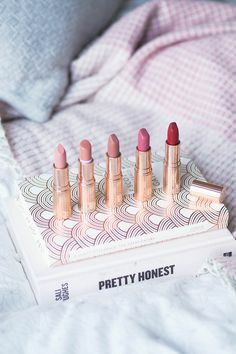 I really love that they have thought about undertones as a lot of brands just make everything with a yellow undertone – and that makes someone like me, with really pink undertones, look ill. Unfortunately, their ‘fair’ shades are really what most brands would call ‘light’. I am very fair and typically require the lightest shade that a brand has to offer, but all the colours are too dark for me. I could possibly make the Sunset Tones work with how light the powder is, but it is just far too yellow for me. I left the powders on my arm for many hours to see if I had a reaction, but there wasn’t any sign of irritation, so I think it will be a suitable product for other sensitive skinned people out there, I just wish there were lighter pink or neutral colours to choose from. 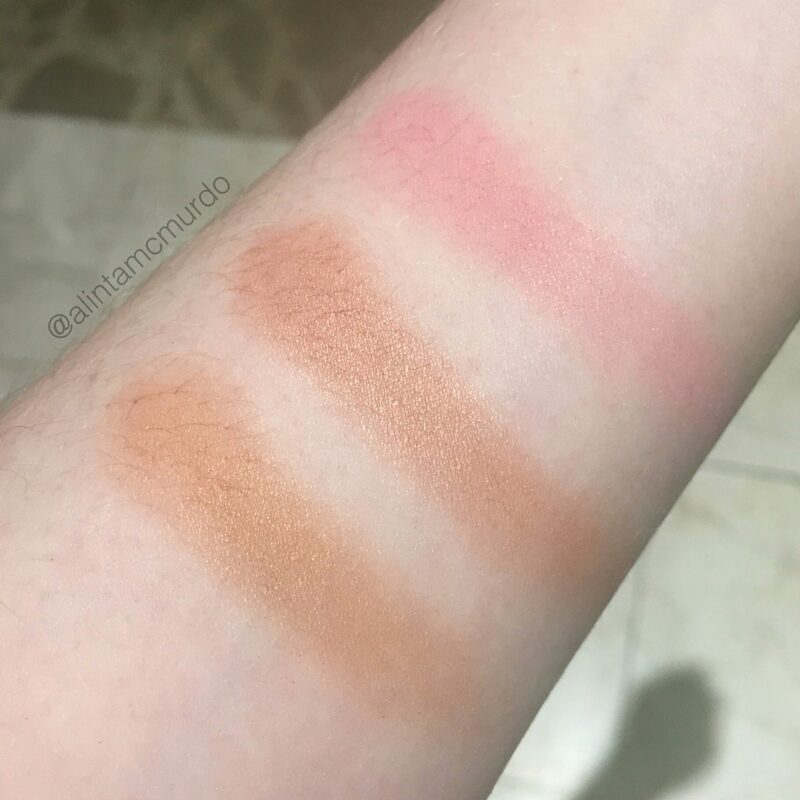 Dusty Girls Natural Mineral Foundation swatches, Fair Minerals with Sunrise Tones, Fair Minerals and Fair Minerals with Sunset Tones (L-R). 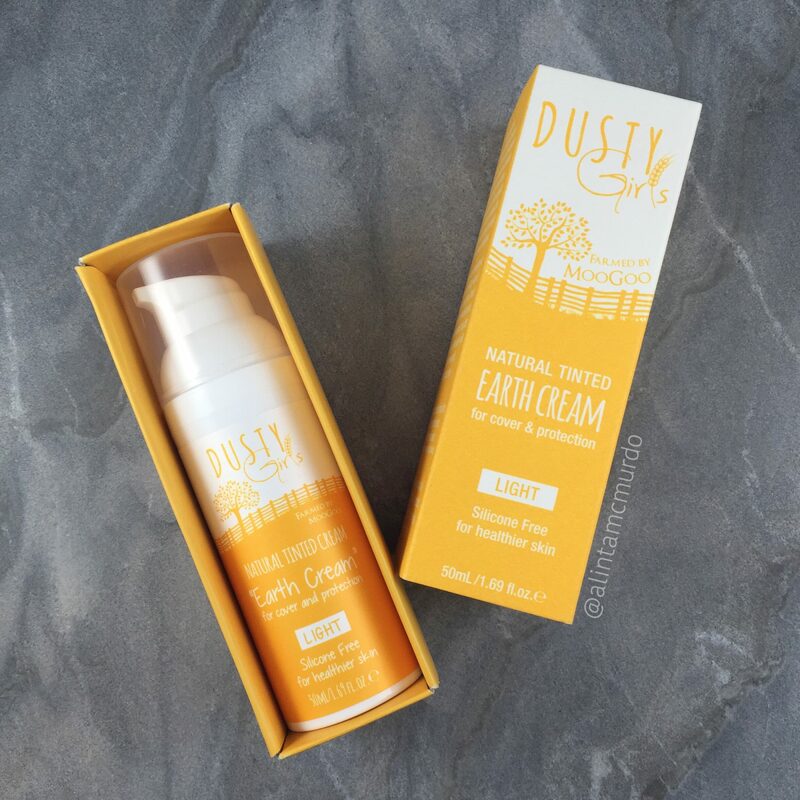 The Dusty Girls Earth Cream is a tinted cream that can be used in the same way a tinted moisturiser or BB cream would be. It is advertised as being lightweight, natural looking and radiant, and ideal for acne prone skin. It comes in a sturdy pump bottle, that isn’t easily broken, and costs $18.50 for 50ml. I have the cream in the ‘light’ shade but there is also a ‘medium’ shade available. As with the Natural Mineral Foundation, the light Earth Cream is too dark for my skin tone, but I have still tested it by wearing it on days I’m home. Before I tried the Earth Cream, I read some bloggers reviews on it, and the consensus is that this cream is great for oily skin, but my skin is combination to dry, so I was hesitant that this would work for me. The cream is quite thick when you pump it out of the bottle, but it spreads out on the skin easily, and it doesn’t cake or cling to the drier parts of my skin. It does have a slight balling effect when I spread it out (like a primer can do if you put too much on) but the balls fall off easily and quickly and seem to have no effect on the look of the cream at the end. It has light coverage, so if you have an active red pimple, you will need some concealer too, but you can also layer this cream on top of itself, as long as you let the first layer dry before doing the second. The Dusty Girls ladies also mentioned that you can use the Natural Mineral Foundation over the Earth Cream if you want more coverage from these products. The Earth Cream feels really nice on the skin and the finish looks nice despite my drier patches at the moment. I seems to work with combo to dry skin types as it has shea butter, vitamin E and quite a few oils that are good for all skin types. 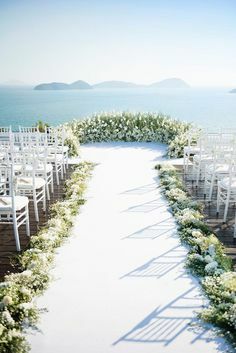 I haven’t been able to test the wear out in rain and wind in winter, or heat and sweat in summer, but I think it would be a cream I would enjoy using if it were in my colour. Some people like that there are only two colours available as they find it easier to choose a colour online, but I’m not one of them. 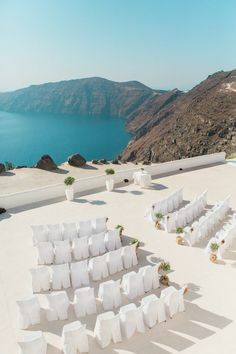 I would really like it if this cream came in a lot more colours, especially one for very light skin, and colours that suit darker skin tones too. The Dusty Girls Natural Mineral Bronzer comes in one shade called Sunshine. Sunshine is a pressed bronzing powder that has warm, golden undertones with a soft shimmer throughout. The 15g compact costs $25 and comes in an orange pan with a clear lid that has the Dusty Girls logo on it. It is advertised as being suitable for all skin tones but it is far too warm for me to be able to use as a bronzer, let alone contour colour. This will however be a good colour for anyone with darker light skin tones and medium skin tones. I have swatched this bronzer quite a few times now, trying to get it to work for me, and it hasn’t irritated my skin any of those times. 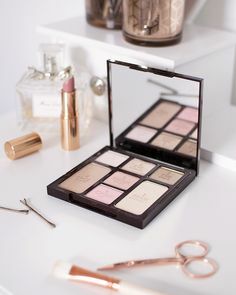 It contains Macadamia and Jojoba Oils as well as vitamin E. I would really love to see Dusty Girls make a cool toned bronzer/contour colour, as I would go out and buy that. 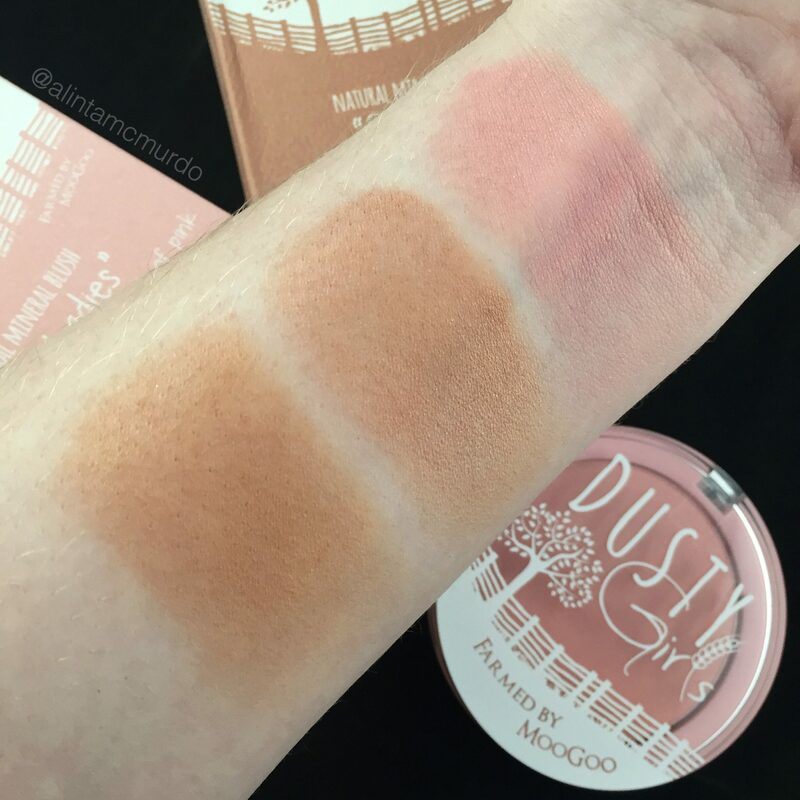 Dusty Girls Sunshine Bronzer, Golden Delicious Blush and Pink Ladies Blush swatches (L-R). Dusty Girls also make a Natural Mineral Blush that is $25 for 15g. They have two colours, Pink Ladies (soft pink shimmer), and Golden Delicious (gold and terracotta tones). 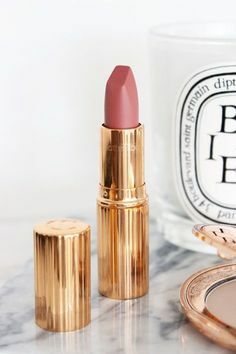 Pink Ladies will suit light skin with pink or neutral undertones and Golden Delicious will suit medium to dark skin tones and those with more yellow undertones. These pressed blushes have natural micas, jojoba and macadamia oils as well as natural vitamin E ‘to increase the staying power’ of the blushes. I own Pink Ladies, but I went to a stockist multiple times to try and get swatches that would show the true colour of all the cheek products. Golden Delicious is advertised as being a matte blush (as opposed to the shimmer that Pink Ladies has) but if you look at my swatches, you will see that Golden Delicious actually has a nice sheen to it. There are noticeable little sparkles/glitter in the Pink Ladies blush but they don’t really transfer to the skin much, so there isn’t a lot of shimmer on the cheek, which I prefer. I have used various synthetic blush brushes with Pink Ladies and they have all worked. It isn’t one of those pressed powder products that only picks up with a certain type of brush. I have found it easy to put on a thin layer so that I don’t end up looking like a clown, but it is also easily built up for anyone with a darker skin tone than me. 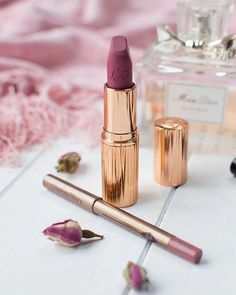 Pink Ladies is such a beautiful pink colour, it isn’t too neon or too pastel, so it gives the perfect flush of colour. It thankfully comes in quite a big pan, so I won’t need to replace it any time soon, but if/when I do run out, I will be repurchasing the Pink Ladies blush. The packaging on all of the Dusty Girls products is well thought out. The products come in a textured cardboard box with a push out draw that the product sits in. Each box has lots of information about the product, so it is useful to keep, but you can recycle them when you’re done, which is great. They also make a little synthetic kabuki brush that you can use with all of their powder products. It is a decent brush for $12.50, and very soft, but there are others in my collection that I will reach for over the Dusty Girls one. The brand is vegan, cruelty free, natural and made for sensitive skin, which are values I appreciate in a company. Out of all the face products, the Pink Ladies blush is certainly my favourite. I would really like to be able to use their base products (Mineral Foundation and Earth Cream) but the shade range needs to be increased. My main issue with the brand is that the colours mainly cater to those in the middle of the skin shade spectrum. I think it would be great if they made products suitable for very fair skins (like mine) and products for darker skins too. If I could access products that suited my skin tone then I think Dusty Girls could make up a large proportion of my daily use products. 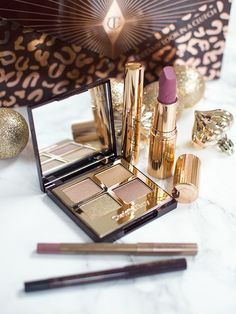 I still have the other products from Dusty Girls that I will review which include eyeshadows, lip gloss, lipstick and mascara. You can sign up to my email updates if you would like to be notified when that blog post is live. I also have more MooGoo products to review and the Dr Zoo pet products as well. The Dusty Girls website has a list of Australian stockists that you can get the products from, plus they are available on the website. They also have UK and US websites and distribution centres so that everyone can enjoy these products. If you don’t live in Aus, USA or UK, then you can buy from the International/Australian website (they ship to Canada, China, Hong Kong, Japan, New Zealand, Singapore, South Korea, Taiwan and United Arab Emirates). You are also able to buy Dusty Girls and MooGoo products in the same order by clicking “Jump to Moo Goo” after putting your Dusty Girls products in your cart. They are working on a new website that will enable you to also buy Dr Zoo in the same order too. Do you like the look of the Dusty Girls face products? Is there something in particular that you will be picking up to try? I love the look of the Pink Ladies blush. Even though I have more of a medium colouring I think this would still be my first pick from the range you featured. I have the same problem as you Alinta – very fair/fair skin with cool/pink undertones & every “light”, “porcelain” or “fair” foundation/tinted moisturiser/BB cream/CC cream is too dark or yellow-toned for me! I don’t know why companies don’t cater enough for us – light & medium aren’t the only skin tones out there! But enough rantage from me…I’m tempted to pick up the Pink Ladies blush at some stage. 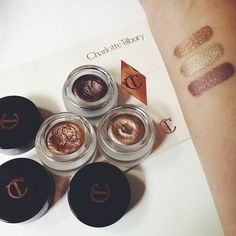 I’ve swatched it before & thought it was nice, but I think I was turned off by the shimmer. I might still give it a go though. I love the pink lady blush. It looks so pigmented and beautiful! I have heard of this brand before but haven’t tried any of their products. 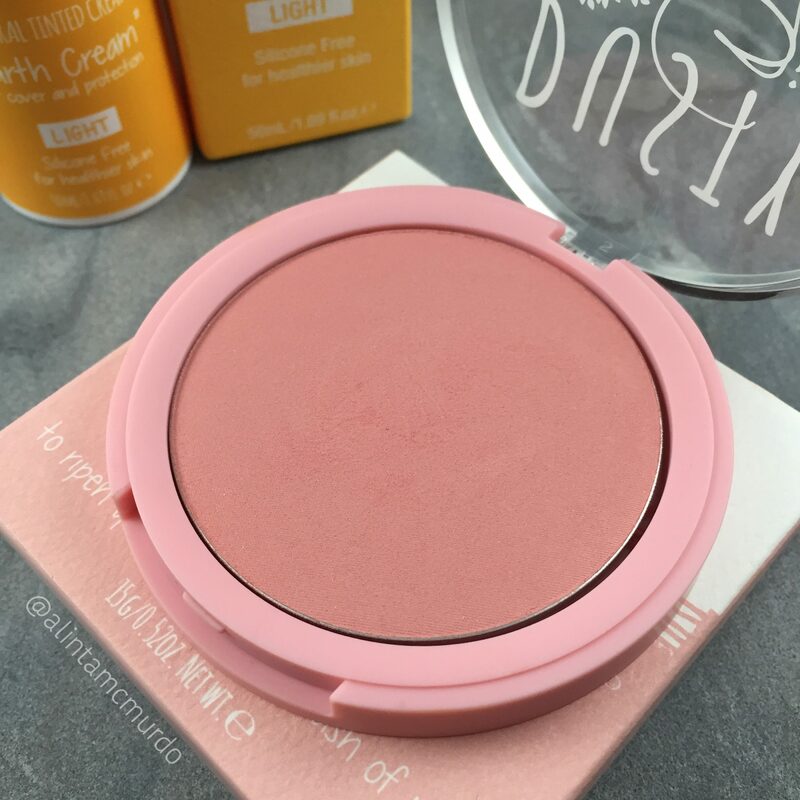 The Earth Cream and Blush both sound great!